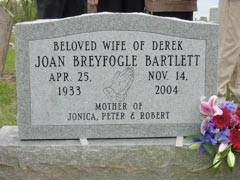 Bartlett, Joan Patricia Breyfogle. Passed away on Sunday, November 14th . Beloved wife of Derek. Adored mother of Jonica, Peter and Robert and grandmother of Emma, Alexander and Nicholas, Kitty, Bonnie and Tallulah. Funeral Service at the church of St Michael the Archangel, Warfield. Friday, November 19th at 2:30 p.m.... Donations to the M.S. Society gratefully received c/o Lines Bannister, 69, High Street, Ascot, SL5 7HP. AAFA NOTES: Joan died in England, so there is no SSDI record. Joan’s father, Robert, was the son of William Roland Breyfogle and Mary Edith Johnston, both Ohio born. Robert married Elsie McLaughlin of Toronto, Canada and he worked for 1st National City Bank of New York, specializing in their overseas operations. For this reason Joan and her brother Peter were born in Barcelona, Spain. At the start of World War II they were evacuated from Spain to Cuba where the family remained until the end of the War. Robert was transferred to London in 1947 and lived and worked in England for the rest of his life. Joan attended an English school but went to Vassar College in the U.S.
My family lived some 6 miles from the Breyfogles and Joan and I met at a New Year’s Eve party! We were married in January, 1956 when Joan was 22 and I was 25 and were blessed with three great children, Jonica, Peter and Robert. Sadly, just before the birth of our youngest, Robert, Joan was diagnosed with Multiple Sclerosis. For a year she was confined to a wheelchair and her vision and speech were impaired. However, Joan had enormous courage, determination and faith. She was not going to let MS defeat her. No drugs were available for treatment and still aren’t but her doctor recommended a low fat diet. By sticking to the diet and with unbelievable will power she slowly improved. As time went by she was walking talking and seeing normally. For the next 35 years she managed to control the MS and was able to partake in full family life with her growing up children. She was a regular attendee at our village parish church of St.Michael. When the children had all fled the nest, she turned her energies to family history and genealogy. In 1992 she took a degree course in these subjects at London University and became very active in the Daughters of the American Revolution, based in Washington DC. She joined the Mexican Chapter of this organization and became their honorary chaplain. Joan’s great-great-grandfather, Joshua D. Breyfogle took part in the Californian Gold Rush of 1849 and her great-grandfather fought in the Civil War. I was fortunate to know Robert Breyfogle’s mother, Mary Johnston, who lived here in England for the last 15 years of her life. She was an exceptional person, one of the kindest I have ever met. Joan took after her! Joan lived life to the full, overcoming hip and knee replacement surgery, and finally contracted pneumonia after we had made a short visit to Washington DC for her to attend a week’s Genealogy course at the DAR headquarters in October 2004. She passed away 10 days after returning to England, only 3 months before our 50th Wedding Anniversary. As instructed in her will, Joan was cremated, and half her ashes were buried in the family plot at Beechwood Cemetery, Morning Sun, Preble Co., OH and half were retained for burial with me, in due course! It is very likely that Joan was not an Alford descendant. 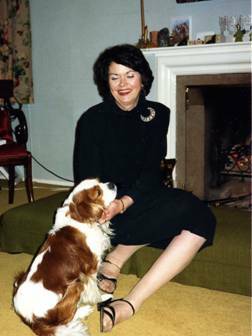 The late Eileen Alford, who researched the line of Consider Alford 1778 England and wrote Alford-Kennedy Family History (San Antonio, TX, 1971), told Joan that she was a descendant of Consider’s first daughter, but Eileen did not know the daughter’s name. No Alfords appear in the online family trees for Joan’s father and mother, and AAFA has not been able to identify any.